Connect.Teaching is an innovative project in South Sudan that aims to improve the quality of learning in primary school classrooms. The project provides tablets containing instruction and curriculum resources to teachers in remote or conflict-affected places, enabling them to access educational resources previously unavailable to them. 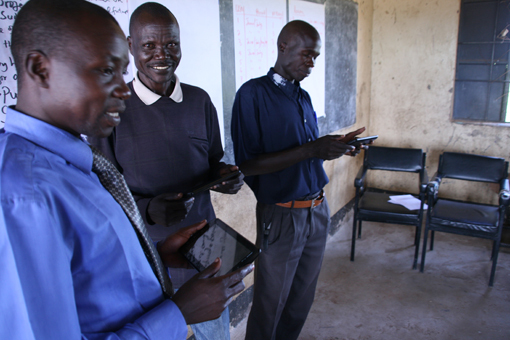 During the one-year pilot phase launched in June 2012, selected teachers were equipped with tablet computers and supported with training. The evaluation conducted in September 2013 collected data through a usage report from each tablet, a classroom observation tool, review workshops, and interviews with children, teachers and teacher-trainers. A baseline conducted in 2012 and an Early Implementation Report (Nov 2012) provided additional information. The evaluation found that the twenty-three teachers in eleven schools demonstrated improved classroom teaching skills, benefitting children in targeted schools. However, more structured research covering a larger number of trial schools is necessary to obtain more conclusive evidence. The evaluation also found that the introduction of tablet computer technology for educational purposes in present day South Sudan was a feasible and sustainable option worth pursuing, and provided some valuable lessons to further improve the project in the next phase. These included appointing a dedicated programme coordinator, providing more training for teachers on how to use the tablets, further embedding the project within government structures, and revising the technology.